There are a number of success stories on species recovery associated with the Louisiana Department of Wildlife and Fisheries (LDWF) and in February 2011 they added one more. The department initiated a whooping crane re-population project that has been as challenging as any previous effort. Finally the project to reintroduce a whooping crane flock is experiencing some hoped for success. 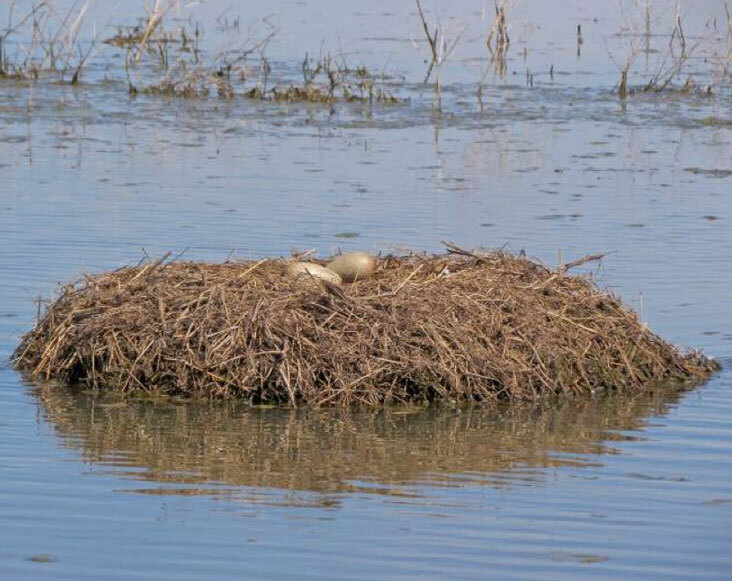 A pair of the reintroduced whooping cranes has produced two eggs in the wilds of Louisiana for the first time in 70 years, the state LDWF announced on April 15. LDWF Secretary Robert Barham told the audience at the 13th North American Crane Workshop in Lafayette about the important occurrence in the reintroduction of the endangered birds to the wild. Once widespread, the whooping crane population had plummeted to a historic low of just 15 known individuals in 1940-41. The decline was mostly due to hunting and the conversion of wetland habitat into agricultural fields. 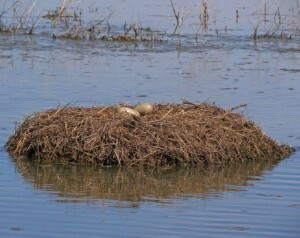 “This is the first time that a whooping crane pair has produced eggs in the wild in over 70 years on the Louisiana landscape,” Barham said. The LDWF has been releasing whooping cranes into the wild in the White Lake area since 2011 in an experimental project. Since then 50 of the whoopers have been released, and 30 have survived. Twenty of the birds have died due to predation or natural health problems while 5 have been killed or wounded in shooting incidents. For Louisianans, the sight of a whooping crane in the wild has been only a distant memory. The last record of the species in Louisiana dates back to 1950, when the last surviving whooping crane was removed from Vermilion Parish property that is now part of LDWF’s White Lake Wetlands Conservation Area. Now there is much hope for a restored flock. Friends of the Wild Whoopers (FOTWW) believes that Louisiana may have the most favorable opportunity to reestablish a new population of whooping cranes. Why? Whooping cranes need wetlands. Wetlands make up most of the only remaining wild whooping crane’s nesting habitat in Wood Buffalo National Park, Canada and most of their winter habitat at Aransas National Wildlife Refuge in Texas. Coastal Louisiana embraces one of the most wetland-rich regions of the world, with 2.5 million acres of marshes (fresh, brackish, and saline) and 637,400 acres of forested wetlands. It contains about 40 percent of the coastal marshes in the coterminous United States. So, Louisiana has the necessary habitat which is a most important need for whoopers. FOTWW hopes for the best in Louisiana. The Louisiana whoopers are not the only cranes in the wild. A self-sustaining wild population of whooping cranes migrates between Wood Buffalo National Park in the Northwest Territories of Canada and Aransas National Wildlife Refuge in Texas. Like those in an eastern migratory population, the Aransas group remains vulnerable to extinction from continued loss of habitat and catastrophes, either natural or man-made. Multiple efforts are underway to reduce these risks and bring this magnificent bird further along its path to recovery. This includes increasing populations in the wild, ongoing efforts to establish a migratory population in the eastern United States and establishing a resident (non-migratory) population in Louisiana. The White Lake marshes and vast surrounding coastal marshes of southwest Louisiana was a positive factor in the decision making process that led to the experimental population approval. The goal of the LDWF’s reintroduction project is to establish a self-sustaining whooping crane population on and around White Lake, which contains over 70,000 acres of freshwater marsh. A self-sustaining population is defined as a flock of 130 individuals with 30 nesting pairs, surviving for a 10-year period without any additional restocking. Whooping cranes do not generally nest until 3-5 years of age, so the nesting success of the Louisiana flock is now entering that time period. The long-term goal of this reintroduction is to move whooping cranes from an endangered species status to threatened status. 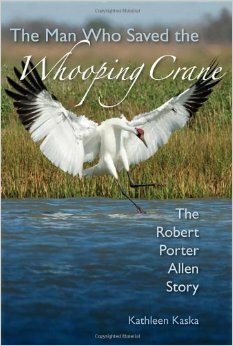 Author Kathleen Kaska gives a slide presentation at 7 p.m. on Wednesday, April 16, at the Dungeness River Audubon Center in Sequim, WA about the work of Audubon ornithologist Robert Porter Allen, outlining his work on behalf of the whooping crane. Allen led an adventurous life dedicated to the preservation of endangered birds when the odds were overwhelmingly against success. He journeyed into the Canadian wilderness to save the last flock of whooping cranes before encroaching development wiped out their nesting site, sending them into extinction. Published by the University Press of Florida, the book was released in September 2012 and was nominated for the George Perkins March award for environmental history. She will be available to autograph her book. After graduating from the University of Texas at Austin with a degree in physical anthropology, Kaska taught middle-school science for 25 years. She was a staff writer for Austin Fit magazine from 1998-2002. Her articles have appeared in Cape Cod Life, Marco Polo, Agatha Christie Chronicle and Home Cooking magazines. She is a frequent contributor to Texas Highways magazine. The Dungeness River Audubon Center is at 2151 W. Hendrickson Road, Sequim, WA. From the August 2010 edition of Texas Parks and Wildlife Magazine. With grace, stamina and charisma, the whooping crane has shown an extraordinary ability to survive. What does the 3-D blockbuster film Avatar, with its lush reimagining of Edenic nature on an alien moon, have to do with the whooping crane? It’s true, the whooping crane story plays out like a Hollywood script: starting with tragedy, continuing with struggles and setbacks and ending with renewed hope and dreams for the future. The secret, though, lies in the word “avatar,” for the whooping crane is quintessentially a symbol of our own planet’s untamable past, conjuring up those half-remembered magical moments when the world was young and great white birds flew over vast marshlands and dark forests larger than life. Click to read the rest of Noreen Damude’s article “Whooping Cranes Prove to be Tough Survivors”.